In 1997, I wrote a paper which generalized the classical Horton-Izzard conceptual model of overland flow for rating exponents in the range of 1-3. The results were based on the integration of several complex mathematical functions. 1 Our first attempt was to use existing software, but we soon realized that something was wrong: The outflow hydrograph was not as expected... the water was actually flowing uphill! I told my coauthor, graduate student Sumner Hasenin: "There is something wrong with this solution. Water does not flow uphill." I instructed her to start from basic principles, to integrate the functions by parts, and to develop the correct mathematical solution for this problem. Two weeks later, Sumner came back with the answer to the puzzle. The software that we were using had an error: A minus sign had inadvertently been changed to a plus sign. Once we placed the minus sign were it belonged, the solution behaved as expected, correctly depicting the rising limb of typical overland flow hydrographs. Thus, the moral of the story: If you are solving a physical problem, it behooves you to have some knowledge of the physics; otherwise you will be unable to assess the accuracy of the calculated results. 1 Ponce, V. M., et al. 1997. "Generalized conceptual modeling of dimensionless overland flow hydrographs," Journal of Hydrology, 200(1997), 222-227. 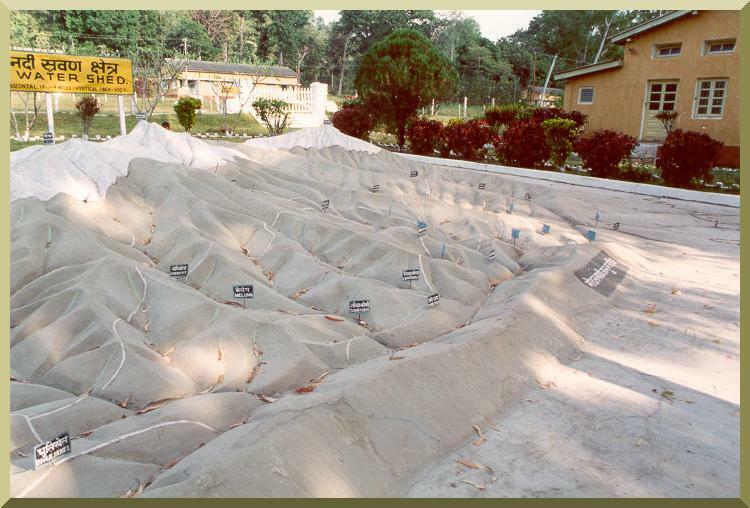 Physical model of the Kosi river basin, Chatra, Nepal.